Myra Lucille Davis, 95, of 1020 Davis Road Millmont, entered into rest at 3:30 PM on Friday, November 30, 2018 at Rolling Hills Manor. She was born on September 09, 1923 in Crawford County, a daughter of the late Joseph Mayer and the late Alice Virginia (Findley) Malcolm. On July 3, 1953, she married Harry Davis, who passed away on April 12, 1990. She was a graduate of Summit School District. Lucille worked for Hartley Twp. for 25 years as Secretary and Treasurer. Earlier in life she worked as a school aide for Mifflinburg School District, worked at Scarlet D and the former Bell Telephone. During the war she worked at a factory manufacturing explosives. 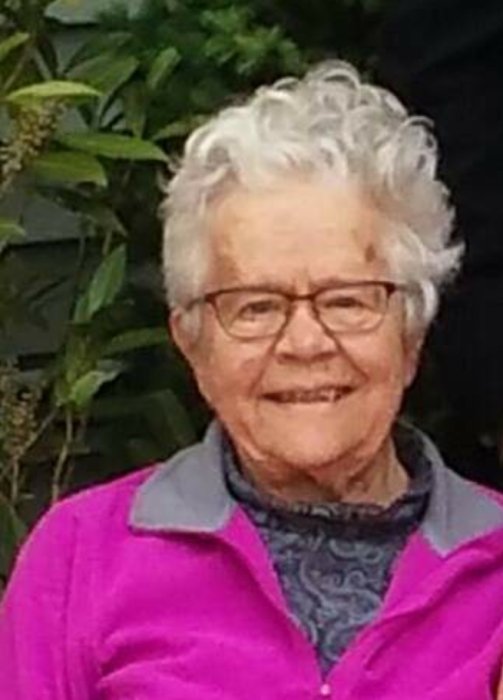 She was a member of the former Laurelton Women’s Club, a member of the West End Library, served as a former Girl Scout leader, and was a member of the Unitarian Universalist Church. Lucille enjoyed gardening, knitting, sewing, cooking, baking, the outdoors, weaving, reading, and listening to music. Surviving is one son and a daughter-in-law, Robert T. and Susan Whiteside of Harmonsburg PA, three daughters and two sons-in-law, Alice and Akis Trivellas of Chaddsford, PA, Susan and Jeffery Benfer of Millmont, Christina Heim of Williamsburg, Barbara and Steven Rishel of Millmont, 11 grandchildren, 14 great-grandchildren, 5 great-great grandchildren, and one niece Stephaine Armstrong of Meadville . She was preceded in death by one son-in-law, William Heim, a sister, Nancy A. Piccolo, and her stepfather, George Malcolm. Family and friends are invited to the memorial gathering to celebrate her life at 1 PM on Saturday, December 15, 2018 at the Hartleton Union Church, Catherine Street, Hartleton. Memorial contributions in Myra`s memory may be sent to the Scratching Post, C/O Angela Brouse, 230 N. Market Street, Lewisburg, PA 17837.